Thanksgiving is probably my favorite holiday of all, since it's about friends, family, and most of all, food. Celebrating it in Spain for the past five years with has been so much fun: looking for ingredients to replace commonplace ones in the US, or looking for local ingredients that sometimes turn out to be even better than those in traditional recipes! For example, instead of Libby's canned pumpkin, I buy roasted pumpkin from the bakeries. The roasted pumpkin has such an intense, caramelized sweet taste, that it is actually a dessert on its own. But put into a pumpkin pie (using the recipe on the Libby's label) elevates that already delicious pumpkin pie to a new, more complex dimension. 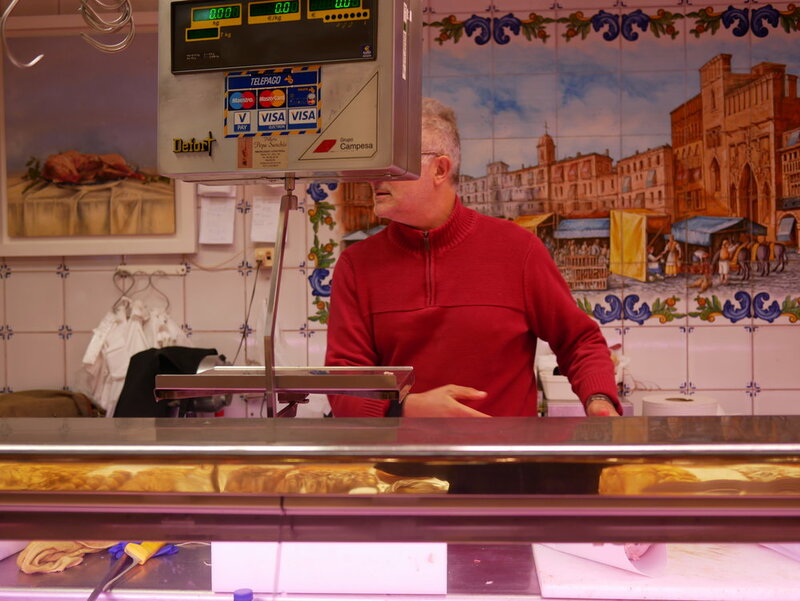 My first year in Spain, I searched and searched for a turkey, and luckily came across a butcher in the Mercado Central that had a whole turkey (rather than a whole turkey missing a leg, or just turkey breasts). And now, I make sure to order the turkey in advance, and the birds (yes, plural, because now I order two every year), are "freshly" slaughtered. This way they're good for dry-brining in the fridge for four days, which is what Alton Brown's recipe calls for. I would be queasy attempting four days with anything in the US, especially since one year I bought a "fresh" turkey just a few days before Thanksgiving from WHOLE FOODS of all places, and it went putrid by the time Thanksgiving rolled around. It went straight into the trash. The biggest challenge for me is to make the whole Thanksgiving dinner for about 12 people every year, for a day that's not even a holiday in Spain. Meaning, while Americans get Thanksgiving Day to make Thanksgiving dinner, I basically have just a couple hours to assemble everything in the evening after a busy day. And forget about trying to host a lunch or dinner on the weekend - that's when Spaniards go home to their parents' homes for family gatherings! So I have to be very disciplined, and after the last few years, I've pretty much gotten a rhythm down for pre-Thanksgiving prep. Yes, I am "one of those" that puts together a spreadsheet with Thanksgiving prep, breaking down the shopping list and cooking activities by day! And one of the most important parts is the hour-by-hour planning for the day-of, because my oven - small by US standards but regular in Spain - only fits so much, so oven space and time is really the bottleneck for getting dinner out. 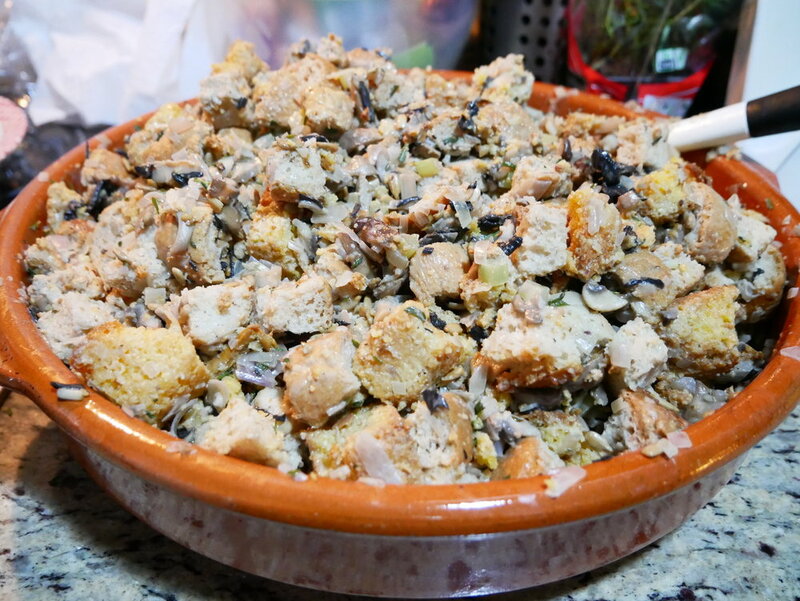 One of the things that I made very far in advance was the cornbread stuffing, which I have made every year since the very first year I did Thanksgiving, about 11 years ago. It's based on this recipe from Martha Stewart, and has gotten rave reviews every year, whether I've made it in the US, the Netherlands (one year), or Spain. In fact, I was surprised how much my Spanish friends have enjoyed this, and they always say it's the dish they most look forward to. This year, I quintupled the recipe just so I would have enough leftovers! 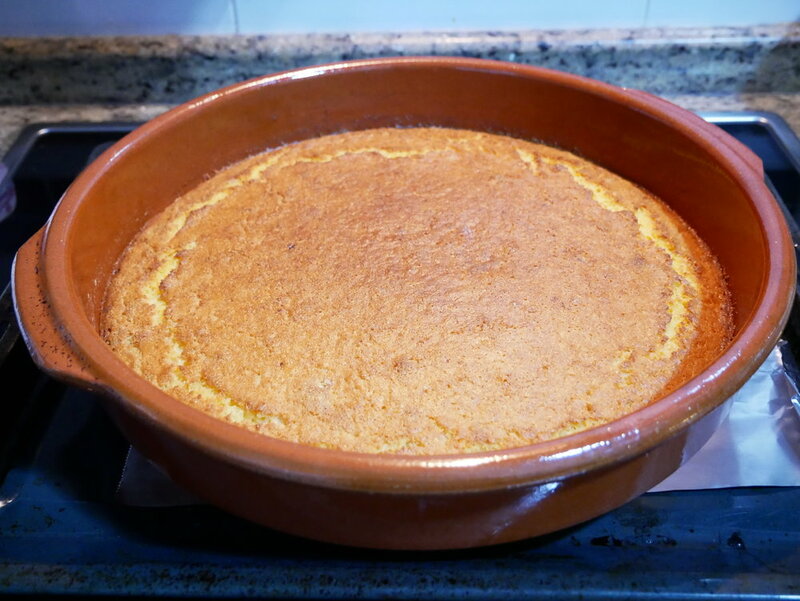 I start with a double batch of the Pioneer Woman's cornbread recipe, which I adapt using only butter and using this Spanish cazuela to bake in the oven (rather than starting it on the stovetop). After cutting it up, along with a couple loaves of fresh bread from the bakery, I make the recipe until the point of baking it. And then I freeze the stuffing in batches. The day before the dinner, I defrost the stuffing in the fridge, and then the day of i put it in a baking dish to bake after the turkey is out of the oven and resting, before carving. 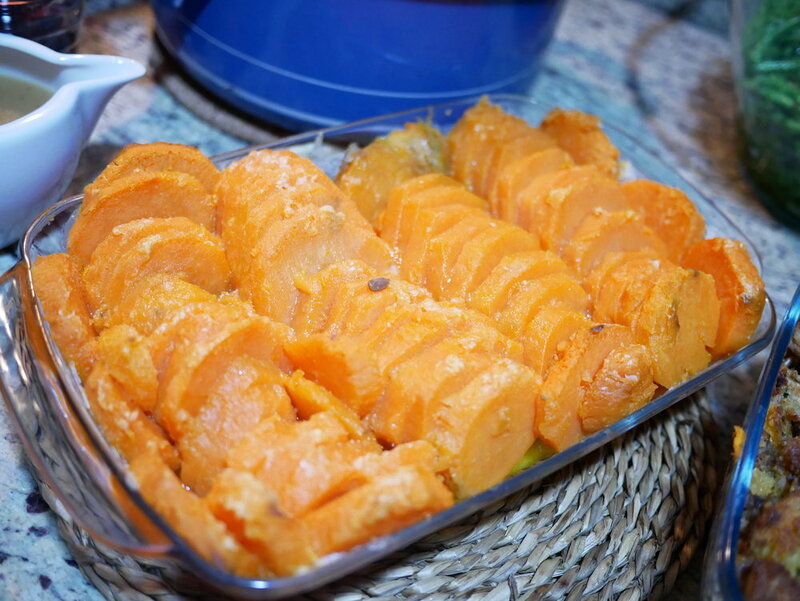 I also found that boiling and assembling the boniato (sweet potatoes) for the Harvey House Sweet Potatoes works well as a make-ahead recipe too. I feared some loss of color or texture, but I found absolutely no difference when I froze the oven-ready boniato and then defrosted it the day before to bake the day of, vs. the year I made this dish fresh. By the way, to the NY Times recipe linked above, I add orange zest and a squeeze of orange juice from our wonderful oranges in Valencia, prior to freezing, and that really adds another dimension to this sweet dish. This year was also the year when I found out just what exactly "rubbed sage" was. It's on the ingredient list in the Alton Brown dry-brined turkey recipe linked above, but I thought it was something you could only find in bottles. Instead, I learned you just have to microwave fresh sage to dry it out, and then rub it, literally, through a sieve to get this fine powder. So easy! Now, instead of following Alton Brown's recipe 100%, I actually discovered a few years ago that cooking the turkey goes much faster when I confit the legs. And I think it's much tastier this way! 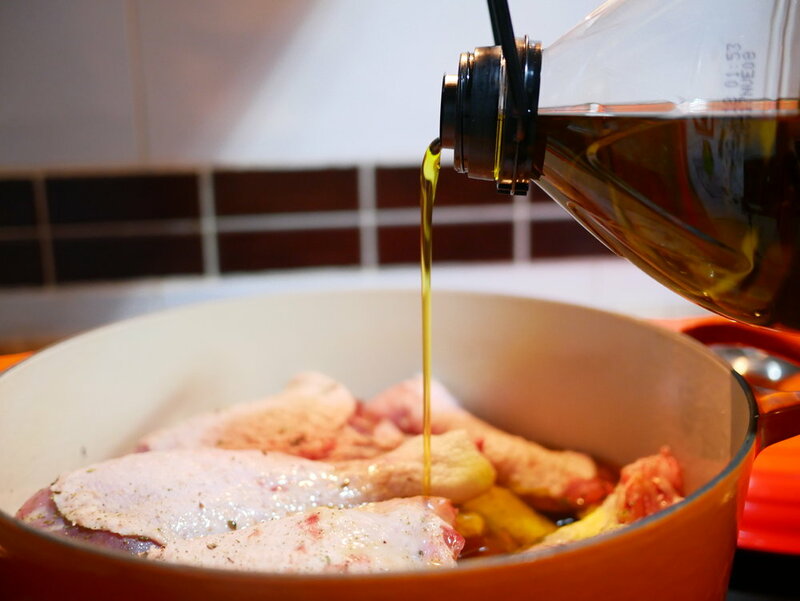 It does use a ton of oil, but this is oil that you can save and re-use later. Making turkey leg confit in advance is another big time saver! 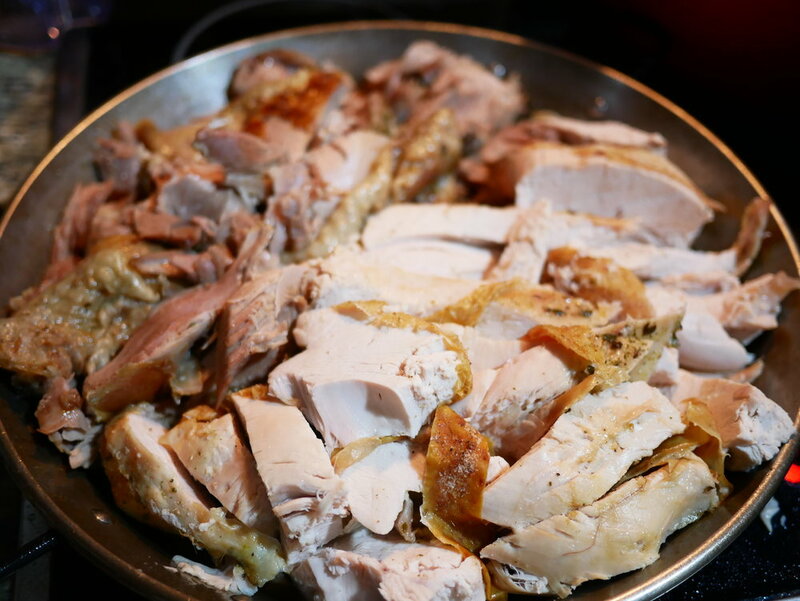 Not to mention, I then cook the turkey breasts separately, ensuring that they are cooked just until the right temperature is reached and they're still juicy. And cooking the breasts of two turkeys actually takes only about an hour and a half. 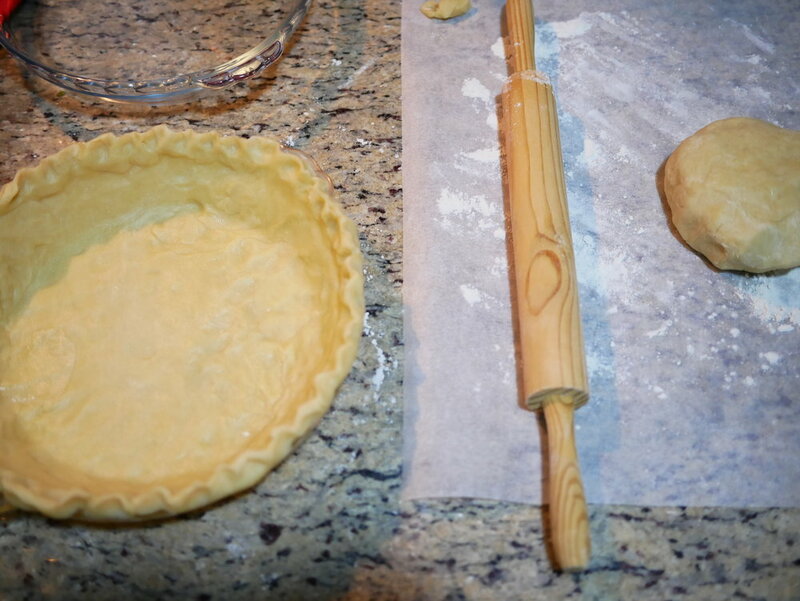 Pie crust is also something that one can make in advance. In fact, I recommend making the pie dough 3 days before the dinner, put the pie dough in the pie plate 2 days before, to let rest 2 hours before blind baking. Then the day before, make the pie filling and bake the pies, so that they're ready the next day. So the day of, there's just the baking of the turkey breast, and the re-heating of the confit turkey legs and searing the turkey legs. Assembling the beet, orange, fennel, and onion is pretty quick too. And I roasted, peeled, and froze the beets in advance, with no strange textures after defrosting! In fact, I think the partially frozen beets might have been easier to slice with the mandolin. Cutting the green beans is something I do in advance (actually this is one of the tasks I enlist my roommate to do, as he is very patient with these processes! ), so that the day of I just have to sautéed them for a few minutes on the stove, with some garlic. Harvey House Sweet Potatoes (or boniato), becomes a simple assemble-and-bake affair, since the prep work was done all in advance. 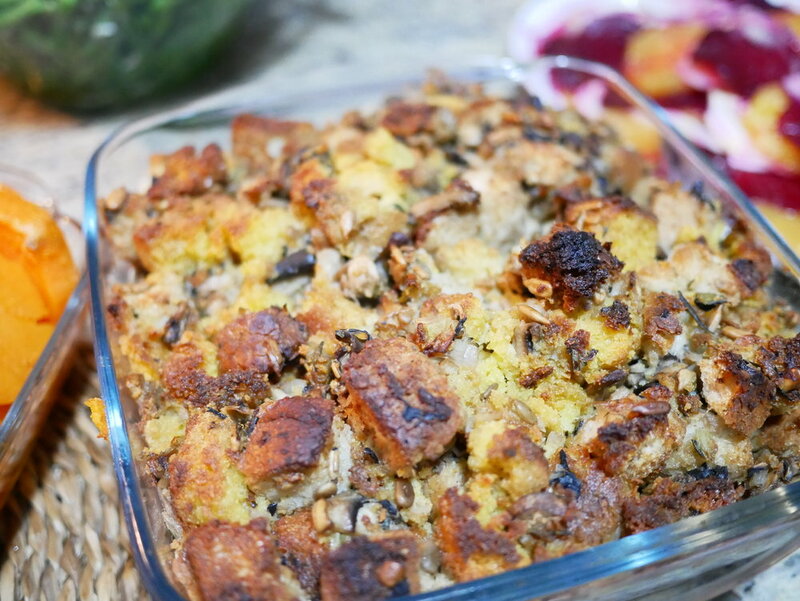 My cornbread stuffing is finally ready to eat, many days after the first steps of making the cornbread! 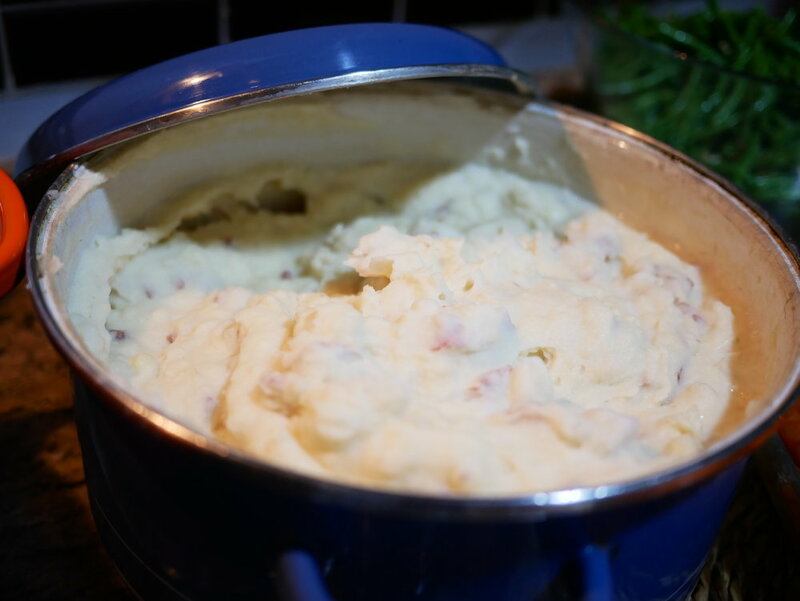 I like skin-on mashed potatoes, and it's actually a very simple thing to make the day-of. Cut and boil potatoes, then add the cream/butter/milk/salt mixture to taste. 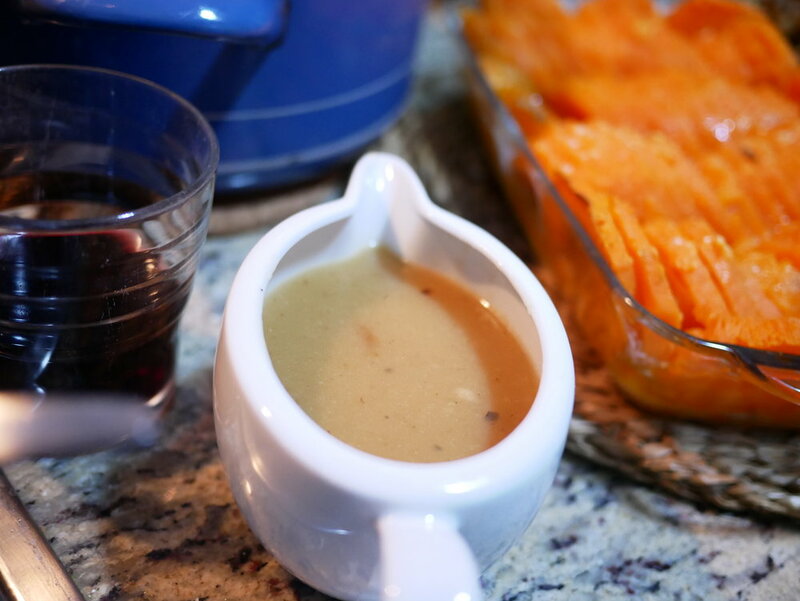 My gravy is something I made well in advance. About a week before Thanksgiving, I roast a few turkey wings, and save the grease along with some onions roasted on the same pan. I also make stock with the bones, and then make a gravy out of the stock, onions, and turkey drippings fried with flour. 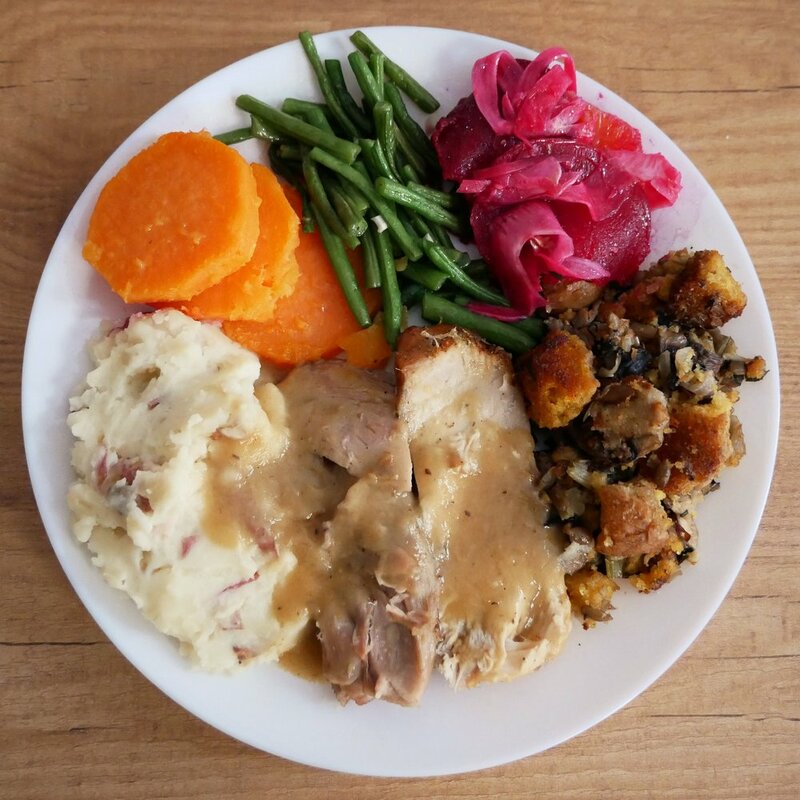 And here are all of the Thanksgiving dishes on one full plate! So here we are! What could have been challenges of making Thanksgiving in Spain difficult, e.g. finding ingredient substitutions and having limited time, actually made Thanksgiving even better, with tastier ingredients and a pretty stress-free preparation, thanks to diligent planning.